Here you can check out my books related to the topics I talk about here at Create If Writing! If you are interested in my books, you can purchase the PDF versions below (if available), or check out my Amazon author page for the Kindle and print version. If you’re wondering which method I prefer (Amazon or direct), I’m okay with either. I get more money from direct.But I also get the benefit of sales rank, social proof, and more sales via Amazon. So…either. This page contains affiliate links, which means at no extra cost to you, I will receive payment for products purchased through these links. Email is the most powerful tool authors and bloggers can use. Period. This is THE book that authors and bloggers need to make the most of email marketing. 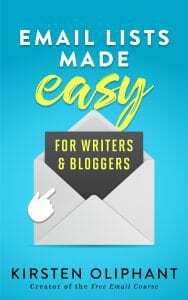 Email Lists Made Easy for Writers and Bloggers is the missing piece to get your list on lock. Far from a boring read on “email marketing,” it will speak in terms that writers and bloggers understand. No one ever says they are glad they waited to start their list. Let your email list work for you. Starting…NOW. 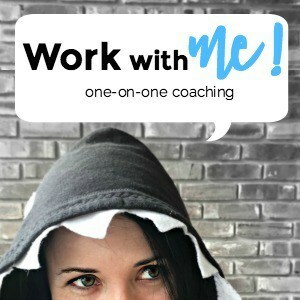 Is your career as a creative solopreneur going nowhere fast? Harness the power of collaboration to supercharge your audience and income. Has fear of rejection kept you from reaching out to influencers? Are you worried about making a bad first impression? 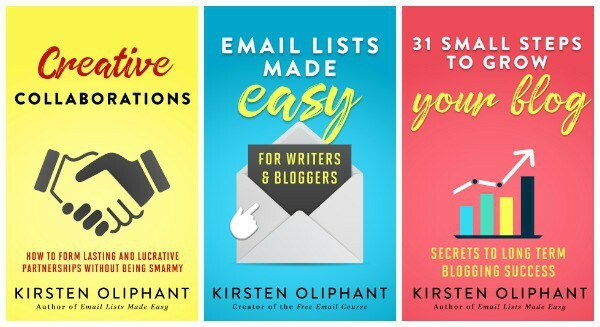 Author, blogger, and podcaster Kirsten Oliphant has landed career-changing speaking gigs and industry leading guests with her simple outreach methods. And now she’s here to help you do the same. 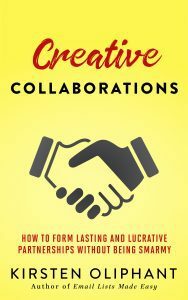 Creative Collaborations is your step-by-step guidebook for expanding your network the right way. If you like expert advice, extra motivation, and practical actions you can take immediately, then you’ll love Kirsten Oliphant’s inspirational resource. Your blog isn’t growing. And with endless five-step strategies to increase your traffic, you’re overwhelmed with information…yet still not seeing results. Stop Googling and start taking action. 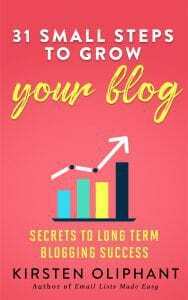 This action-packed workbook contains the foundational things you need to do in order to have achieve blog growth that continues over time. Each step has specific actions you can implement and how often you’ll need to do them: annually, monthly, weekly, or daily. 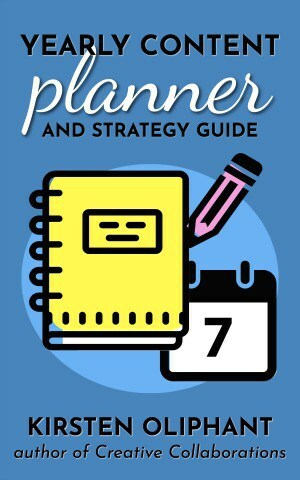 Simple, practical, and easy to implement, this is the how-to guide that won’t leave you guessing or feeling overwhelmed. 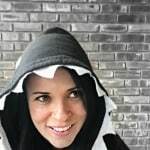 Quit the overwhelm and learn to do what works for long-term growth and connection with your audience. You can also check out my Christian devotionals and fiction by my pen name, Emma St. Clair. She writes clean and wholesome romance. What happens when you pair a case of cold feet with an old flame? Natalie is just weeks away from her summer wedding to her longtime love, but the stress of planning the perfect day has her feeling more anxiety than anticipation. When a freak accident brings old flame Jeremy right back into the middle of her life, Natalie is forced to confront her true feelings. Does she have cold feet or is she about to marry the wrong man? Download your copy of Cold Feet, Hot Summer today and find out if Natalie walks down the aisle or walks away from everything she planned in life!